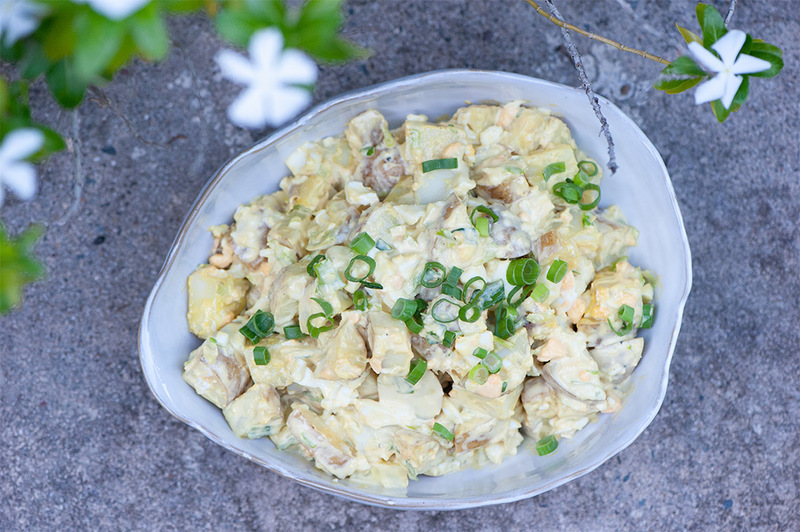 Traditional potato salad is a lovely thing! This simple recipe is a well-loved family favourite and I hope it will become a favourite for you too. It tastes best with homemade mayonnaise, so it’s well worth the 5 or 10 minutes it takes to whip up a batch of your own mayonnaise for this delicious salad. 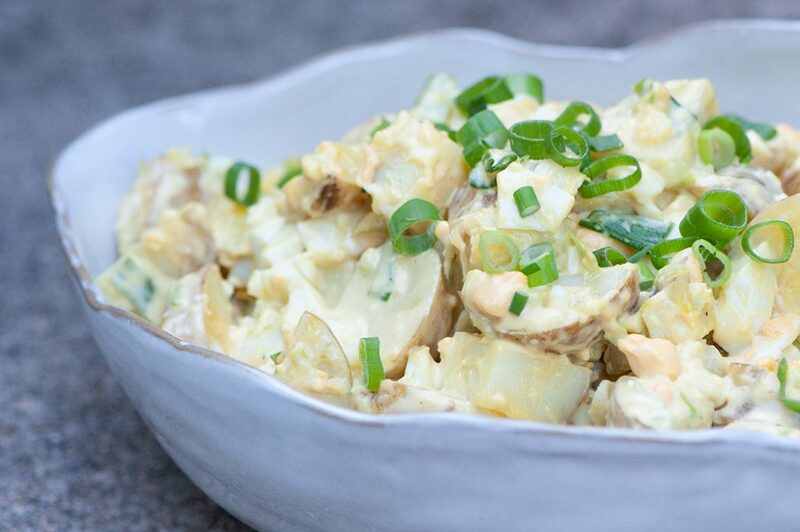 In my native Canada, potato salad is a classic accompaniment to barbeques, and here in the UK I have been reminded of this by our recent spell of fabulous summer weather in the early spring. I will be serving this several times over the coming months! Add water to TM bowl, insert simmering basket and add potatoes to it, then place eggs in Varoma dish, cover with Varoma lid and steam 25 min/Varoma/speed 2. Place Varoma dish with hard-boiled eggs into a sink full of cold water to cool the eggs; meanwhile, lift simmering basket from TM bowl with aid of TM spatula and transfer steamed potatoes to Varoma tray to cool; discard steaming water. Chop spring onions and mayonnaise 7 sec/speed 5. Peel eggs, discarding shells, rinse peeled eggs under gently running water to remove any bits of shell, then add peeled eggs to TM bowl and chop into mayonnaise mixture 5 sec/reverse/speed 3½. Transfer egg mayonnaise mixture to a large serving bowl with cooled potatoes and stir together gently until potatoes are all coated with egg mayonnaise. Season to taste with sea salt and freshly ground pepper if desired. The egg mayonnaise mixture at the end of step 4 can be used (without potatoes) to fill sandwiches or to serve with green salad leaves for an easy lunch or side dish. This is utterly delicious and very simple to make. You will be asked to make egg salad sandwiches often! This recipe is gluten free – please read ingredient labels to ensure all your ingredients are gluten free. For dairy free, use dairy free mayonnaise – my recipe for Laura’s Mayonnaise can be made dairy free by using dairy free yoghurt instead of dairy whey. Also, please read ingredient labels to ensure all your other ingredients are dairy free too. As this recipe uses a large amount of mayonnaise, I do recommend you make your own – so easy with your Thermomix! Personally I avoid bought mayonnaise as it is likely to be made with vegetable/nut/seed oils that are highly refined with the use of intense heat, very high pressure and chemicals such as hexane and bleach. We think so too – enjoy!